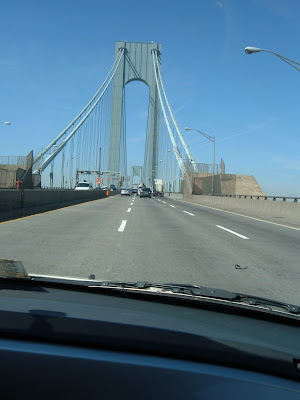 I took this picture on our last trip to New York as we crossed the Verrazano Narrows Bridge. Imagine building a bridge like this in only five years? Bridges are wonderful connectors getting us easily to places that otherwise would be difficult passages. The angels act as unseen bridges between this world and the unseen. As we go about our daily activities, the angels are with us. Just invite them in and watch the results. I always call upon Archangel Michael to go forth and make my path straight and clear. When shopping, whenever I remember to ask the angels for help selecting an item, it's amazing what results I get. Make a pest of yourself and invite your angels to be with you wherever you go. Tomorrow Elliot and I are heading for New York. We'll be traveling lightly with the angels. Archangel Raphael oversees all travel. Call on him the next time you're taking a trip anywhere. Until next week, wishing you joyous gentle journeys with your angelic friends.